Love Bugs Slots is a 5 reel 9 payline video game released by Cryptologic. The game has a cute design with colorful reel icons. Playing Love Bugs you can hit $25,000 Top Jackpot, catch 2 wild symbols, a scatter symbol, play Bonus Feature with 3x Multiplier and 15 Free Games. Enjoy a no download version of Love Bugs in any flash Cryptologic casino. Check it out, the bugs are flirting! Look at the slots symbols, how do you like those presents? I think every man must present sometimes a Diamond Ring, Perfume, Necklace, Flowers, Candies and Champagne. Love Bug even sent cute Lady Bug a love Letter, played Violin and won her Heart. All of these attributes you can see on the reels, they constitute 38 winning combinations. Don’t worry, if your man does not present you diamond rings, you can hit the jackpot and buy one because the payouts are really impressive. 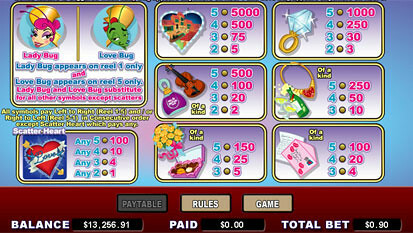 The highest Love Bugs jackpot is 5,000 coins or $25,000 for 5 Hearts. 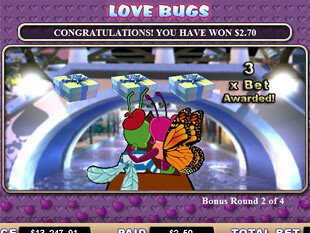 The second Love Bugs jackpot is 1,000 coins or $5,000 for 5 Diamond Rings. 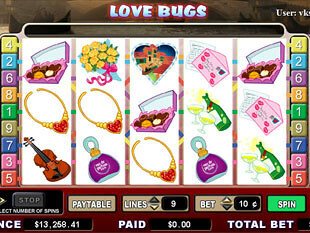 The third Love Bugs jackpot is 500 coins or $2,500 for 5 Violins, Flowers or 4 Hearts symbols. The slots has a good advantage, it offers you two wilds. Lady Bug and Love Bug are wild symbols. This means you have two icons that can substitute for other symbols and complete much more winning combos. Lady Bug appears only on the reel 1 and Love Bug shows up only on the 5th reel. These guys can get you into a bonus game if you manage to drop them both at the same time. Heart is a scatter symbol. It awards you HEART-WINNING Multipliers. If you are lucky to have 5 Hearts, you will get a prize worth of 100 times of your triggering bet. 4 Hearts will award you 10x Multiplier. 3 or 2 Hearts will multiply your total bet by 4x or 1x. You can get the maximum scatter payout of $4,500 playing with the maximum total bet. Bonus Feature. If you manage to set a date for two WILDLY-IN-LOVE bugs, you will get into the bonus game! Trigger Lady Bug and Love Bug at the same time and start your Bonus Round. A funny bonus game will get opened on the second screen. There you will see two love bugs on a romantic voyage in a boat. Also you will see 4 presents. Open one of the presents to reveal your first prize. 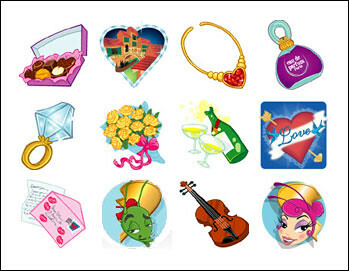 If you find a diamond ring, all your prizes will be tripled, if you find a necklace, you will get 15 Free Spins. After you choose your present, the boat with Love Bugs will move on and grant you 3 more rounds. The whole game consists of 4 rounds. Each time you pick one present and find your reward. 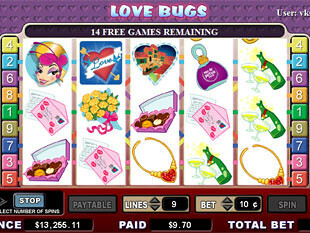 Love Bugs slot machine is a light game with a range of beneficial features,high jackpots and two wilds. Enjoy 15 Free Spins and a cute bonus game with 3x Multiplier.